Location: It is located on the island of Jag Niwas in Lake Pichola, Udaipur. It is a luxury hotel that consists of 83 rooms and suites featuring white marble walls. The guests are taken to the hotel through a speed boat. 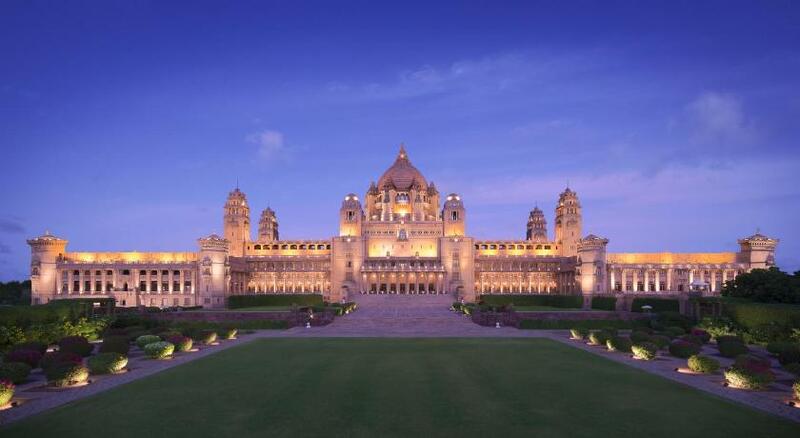 This palace has been voted as the most romantic hotel in India and in the world. Location: It is located 5 miles outside the walls of the city of Jaipur on Bhawani Singh Road. 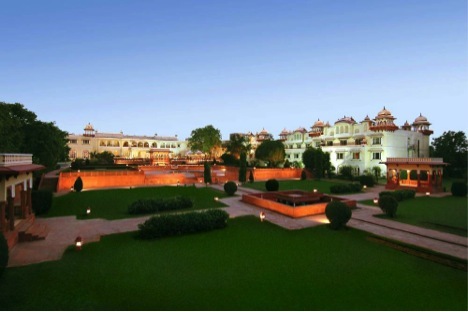 The Rambagh Palace is the former residence of the Maharaja of Jaipur and now it is a beautiful luxury hotel. 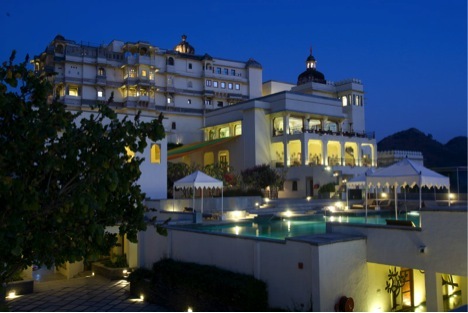 Location: It is located on the east bank of the Lake Pichola in Udaipur. 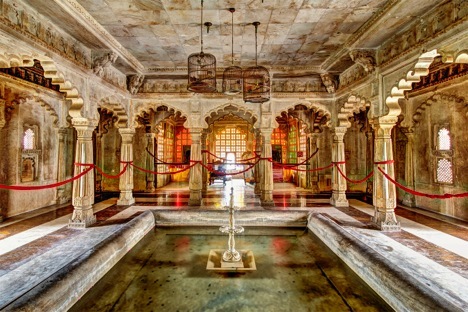 City Palace is a palace complex in Udaipur. It has several palaces built within its complex. Udaipur was the historic capital of the former king of Mewar in the Rajputana Agency and its last capital. Location: Bangalore Palace, is a palace located in Bengaluru, Karnataka. It was built by Rev. J. Garrett, who was the first Principal of the Central High School in Bangalore, now known as Central College. The sprawling grounds surrounding the palace are used for holding public events including music concerts and much more. Location: Umaid Bhawan Palace is located at Jodhpur in Rajasthan, India and is one of the world’s largest private residences. It was named after Maharaja Umaid Singh the grandfather of the present owner Gaj Singh of the palace. This palace consist 347 rooms. A part of the palace is managed by Taj Hotels. Location: Neemrana is an ancient historical town in Alwar district of Rajasthan. It is situated at 122 km from Delhi and 150 km from Jaipur on the Delhi – Jaipur highway in Behror tehsil. Neemrana is actually an industrial hub. This area is also known as Ahirwal region, In 16th century hill-fort was occupied by Chauhans. 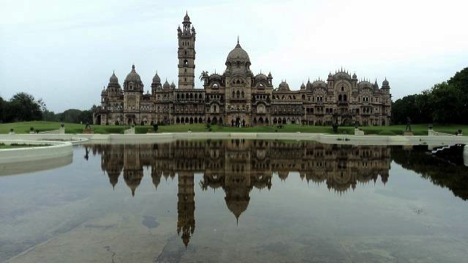 Location: This palace is situated in Vadodara, Gujarat. 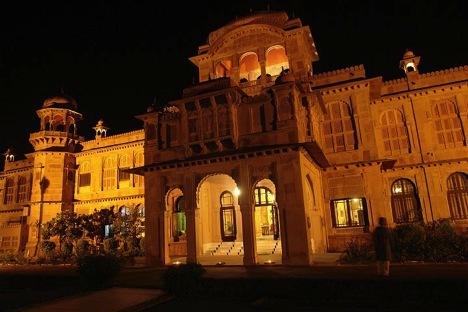 The term Maharaja Palace actually refers to a series of palaces in Vadodara, Gujarat, India. 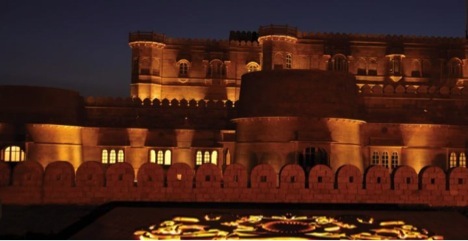 It was constructed by the Gaekwad’s , a prominent Maratha family who started ruling the Baroda State. 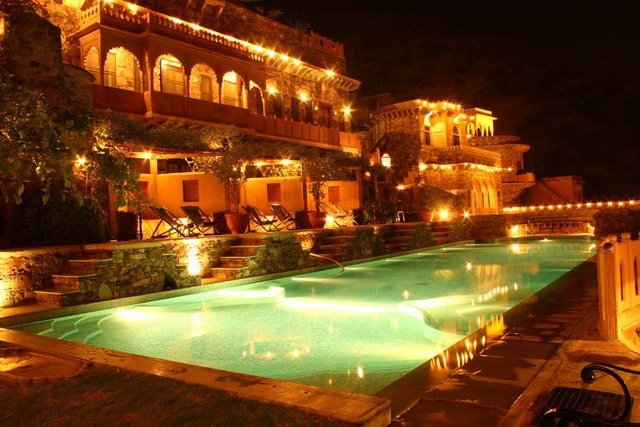 Location: Devi Garh Palace is a heritage hotel and resort, built in the 18th-century in the village of Delwara. 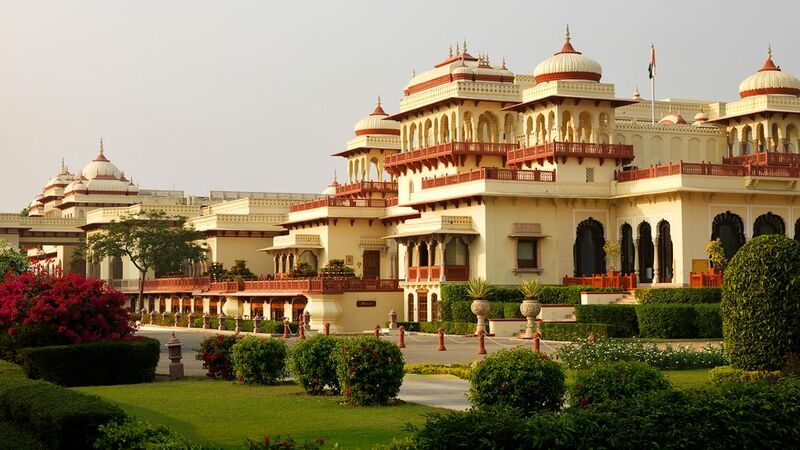 It is situated in the Aravalli hills, 28 km northeast of Udaipur, Rajasthan. From mid 18th century it was the royal residence of the rulers of Delwara principality, till mid-20th century. Devigarh forms one of the three main passes into the valley of Udaipur. Location: Falaknu is a palace in Hyderabad, Telangana, India. The term Falak-numa means “Like the Sky” or “Mirror of the Sky” in Urdu. 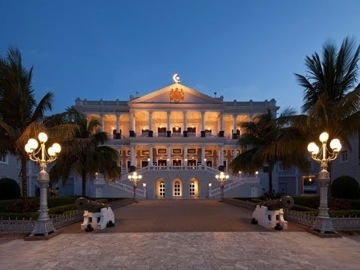 It belonged to Paigah Hyderabad State, and was later owned by the Nizam of Hyderabad. 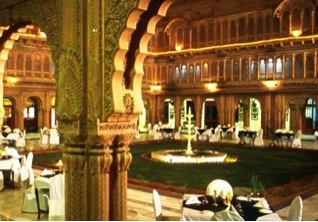 Location: Laxmi Niwas Palace is situated in Bikaner. It is one of the most perfect modern building in the Indo-Saracenic style in India . It is carved out of red sandstone. It is set in a grand palace with an ornate, sandstone exterior. This beautiful luxury hotel is 7 km from the abandoned village of Kuldhara, and 15 km from the Bara Bagh temple. 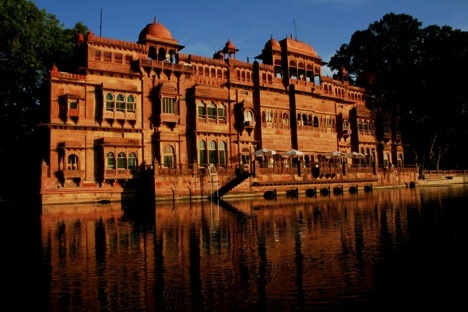 Location: Built by HH Maharaja Sir Ganga Singh of Bikaner on the edge of a lake in Bikaner. Gajner Palace is a diamond in the Thar Desert. The hotel’s compound stretches over 6000 acres. The palace-hotel offers 32 deluxe rooms. Gajner Palace is divided into four distinctive wings: Dungar Niwas, Mandir Chowk, Gulab Niwas and Champa Niwas. 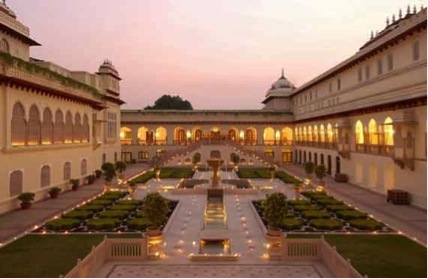 It is set in mature gardens, this hotel is an 18th-century Indo-Saracenic masterpiece and is 6 km from the ornate walled Hawa Mahal palace and 14 km from the iconic Amber Fort. Location: Lalgarh Palace is a palace in Bikaner in the state of Rajasthan. It was built for Sir Ganga Singh, Maharaja of Bikaner, between 1902 and 1926.